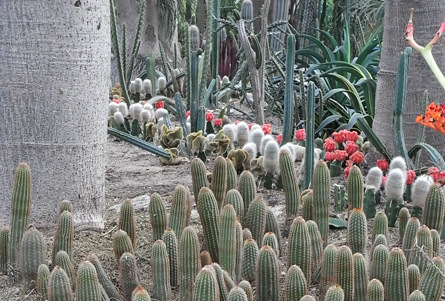 The garden styles of arid places like Santa Fe and parts of Mexico draw inspiration from nearby deserts, and have developed to make the most of little rainfall and scant local resources. Structural walls of adobe or rammed earth with raw finishes protect the garden from harsh conditions outside. Rough stones are arranged as informal garden edging or low walls. Feature walls are washed bright colours that withstand the strong sunlight and provide a contrasting background for the planting. Garden ornaments are rustic and weather-worn. Garden beds are organic and asymmetric or geometric for a more contemporary look, but lawn areas are always minimal. Ground surfaces are covered with loose earthy materials like gravel, sand and decomposed granite. Gravel mulches help drainage but also create a unifying backdrop to exhibit the plants. With so little water to compete for, plants are well-spaced - or arranged in sculptural groups rather than in clumps - emphasising the ornamental features of each individual specimen. Flowers are often colourful and spectacular but only fleeting. 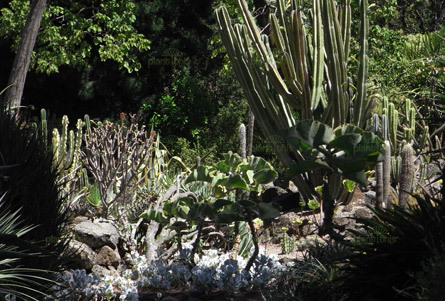 It's the various plant adaptations to conserve water that provide the main, year-round interest: large succulent leaves, thorny or swollen trunks, patterned foliage arrangements and architectural forms. 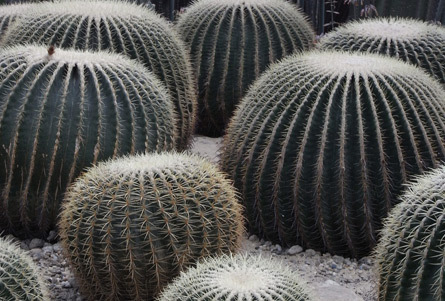 They're mostly cacti and other succulents, but plants with small, spiky or grey-reflective leaves also suit the style. 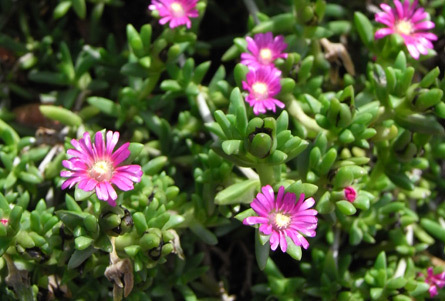 As the backbone of xeriscape gardens - designed to flourish with minimal water - these plants typically prefer dry locations with well-drained soil and low humidity; and are also capable of withstanding extremes of temperature. While the plants enjoy full sun, shade for people is provided under a constructed shelter or a large, carefully placed tree. Use the Plant This Plant Selector to find plants to suit your dry style garden. With so little water to compete for, plants are well-spaced – or arranged in sculptural groups rather than clumps – emphasising the features of each individual specimen.